Yay, another hawker post! I’ve given up on brunch food at cafes haha. I can’t bear to pay more than 10 bucks for outsourced products assembled together on a plate (yes, I’m referring to you, big breakfast). So nowadays, I much prefer to have hawker food as something substantial before unwinding at a cafe with coffee, and cake. Fishball Story (#01-85) does a very decent mee pok tar. The young boss wasn’t there on the day we went, but the helper standing in managed to deliver well cooked noodles lightly tossed in light, piquant marinade that featured a copious amount of lard. Yes, fat is flavour. What stood out were of course, the handmade fishballs. I read that they use only 100% yellowtail fishmeat and that explains the strong, meaty flavour of the fishballs. I still prefer fishballs that are super light and Q but I must have plebeian tastebuds, since the ones that I eat on a more daily basis (my mum buys them from a fishball seller at Bukit Timah Market) probably have a higher proportion of flour. Hainan Hokkien Mee (#B1-34) is run by an old couple. The hokkien mee was the dry type (no sauce!) as the noodles had fully absorbed the wonderfully rich prawn stock. Every bite was extremely “pang” (hokkien expression for delicious, aromatic, and yea.. you get the idea) and flavourful. They also use the thin beehoon here which is my favourite. I don’t know if the Auntie Annie’s Ice Kachang (#01-101) here is the original, franchise, or whatever. But this peanut ice kachang was a delicious respite from the heat. The ice was shaved very finely, and we both agreed that the thick red bean paste was just the right sweetness, and viscosity for ice kachang. Speaking of Ice Kachang, I realise I never posted about a parcel I received a long time ago. Apparently, someone decided to use my ice kachang photo from awhile back (It’s the cropped photo you see below) and she, very kindly, sent me samples of her finished product. 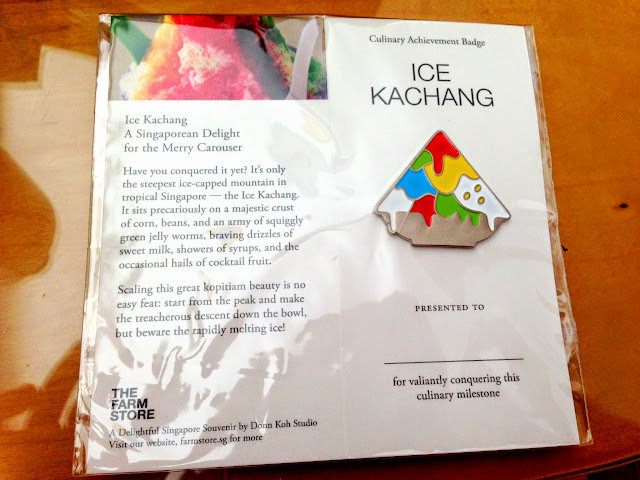 It’s an ice kachang pin! I gave away some to friends who hosted me overseas, but as time went by I chucked the remaining few in my cupboard and forgot about them.